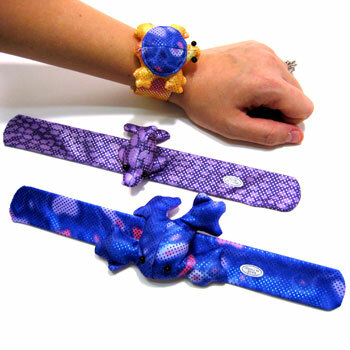 Sea Life and filled glitter-fabric critters perch atop the centers of firmly clutching decorated “slap bracelets.” We thought these were especially unique for the price. Fun and fashionable! Packaged and sold by the dozen. $8.60 per dozen for 15 dozen or more. $7.50 per dozen for 30 dozen or more.